For 30 years, Leslie Cerier, The Organic Gourmet, has worked with organic and natural food’s companies as well as individuals developing recipes that are delicious, nutritious, beautiful and photogenic. Leslie has had the privilege of working the finest sustainable-sourced, organic, fair trade, ingredients mixing and matching them with organic, local, seasonal ingredients to create luscious, healthy recipes with gorgeous photographs and instructional videos. 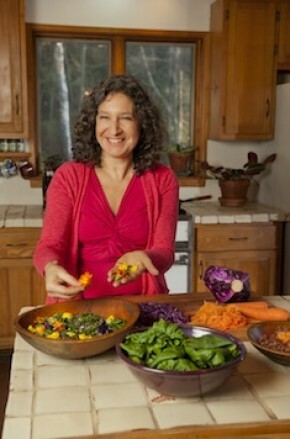 Leslie can also create organic, vegetarian, vegan, and gluten-free recipes for new products. Perfect for Natural and Organic Food Companies, and individuals with special diets. For 30 years, Leslie is much sought after by health professionals and private clients to coach and help them translate challenging dietary allergy issues into culinary success and meal satisfaction. She is happy to develop recipes for you, your company or institution. to discuss your recipe needs. This entry was posted in Blog, Gluten-Free, Recipes, Vegan, Vegetarian and tagged chocolate recipes, Coombs Vermont Gourmet, dietary allergies, Green and Blacks, leslie cerier, Lotus Foods, maple syrup recipes, Nutiva, recipe developer, rice recipes, Teff on 12/06/2013 by Leslie Cerier.